The allure of Lake Lure NC is without a doubt the natural beauty that surrounds the town: mountains, waters and wildlife. The best way to drink in all the splendor of the area is to put on your hiking shoes, grab a nice hiking stick, and walk your way through the wonderful wilderness. We have identified 12 great trekking locations within 35 minutes of the Lake Lure NC Beach area. Each hike offers different visual rewards as you journey through nature’s wonders. Our list of Top 12 Hikes Around Lake Lure NC is in order of hiking difficulty (easy to hard) and provides general information to get you there and let you know the highlights of the hike. For the majority of these hikes we also have links to detailed Trail Reviews where you can learn a lot more about the hikes, see beautiful pictures, GPS trail maps and more. Happy hiking! Highlights: Picturesque views of the surrounding mountains, Lake Lure and area flora and fauna. A special treat from Spring through Fall is the Lake Lure Flowering Bridge. Highlights: Surrounded by nature, well maintained trails and 2 open fields to let the pups run. Also, one nice view overlooking the Lake Lure Municipal Golf Course and up the Hickory Nut Gorge. Highlights: The majority of the trail follows Cove Creek so you have great rushing water sounds as you walk the wooded trail. There are 5 or 6 creek crossings so be prepared to get wet or rock hop. The pay-off: a triple-tiered, 50+ foot waterfall – gorgeous! Directions: Same as above – except – Trailhead is on the North side of the road. 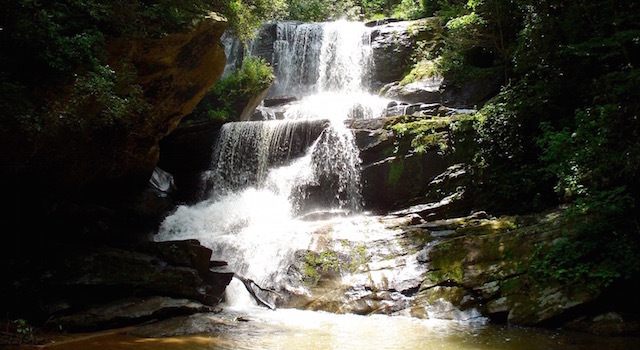 Highlights: Beautiful wooded hike with creek crossings and a nice view of a 100 foot tall waterfall – getting to the base is well worth the effort, but be careful; people have been hurt getting there. Directions: From Lake Lure Beach take 74A North 7.7 miles just shy of Gerton, NC. You will see a house ruin with nothing left but the chimney on the right. Park here. Highlights: Beautiful wooded trails crossing and running along side of several creeks. Some trails pass by small waterfalls and old cabin ruins. Some nice views of Hickory Nut Gorge can be seen when foliage is off the trees. Directions: From Lake Lure Beach take 74A North 8.9 miles to Gerton – Left turn on Bearwallow Mountain Rd. (paved road turns to gravel road) continue approx. 2 miles to where the road is paved once more – park on side of road – Trailhead on South side of road. Highlights: Nice wooded trail that takes you to a huge pasture on the top of Bearwallow Mountain (4232 ft. – tallest within sight of Lake Lure). Walk around the top to see 360 degree views of the surrounding area. Great pasture to let dogs run, run, run … if the cows are not grazing. Please note that this is privately owned and in the Summer months there are cows grazing in the pasture. Please keep dogs on a leash during this time. Directions: From Lake Lure Beach head west on Memorial Hwy. (64W) for 6/10 of a mile. Turn right on Boys Camp Rd (just past Flowering Bridge). Follow Boys Camp Rd. 1.3 miles to the entrance of Park on the left. Highlights: Huge boulders cover the landscape of this park. Watching people boulder and climb can be quit interesting. Views from the trails are best when foliage is down. Numerous side trails will take you to the granite rock face at the base of Rumbling Bald Mountain – a unique perspective. 8. 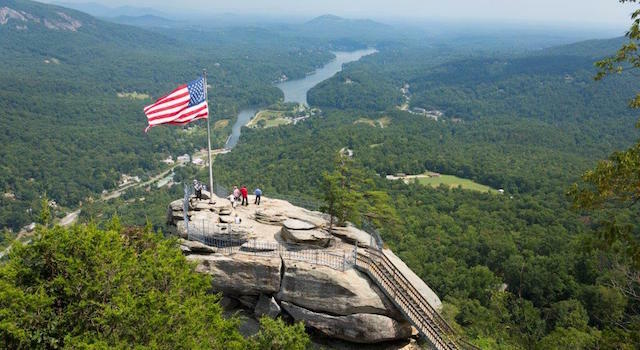 Chimney Rock at Chimney Rock State Park – Lake Lure / Chimney Rock, NC – ENTRY FEE – check official website for the current entry fee. Directions: From Lake Lure Beach take 64W for 1.4 miles to Chimney Rock, NC. The park entrance is on the left. 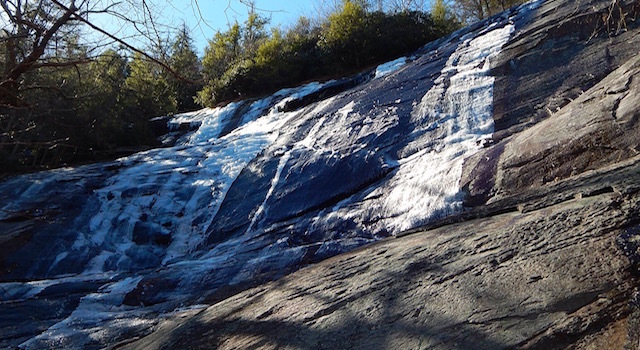 Highlights: Hickory Nut Falls Trail (moderate) takes you to the base of the 404 foot waterfall – gorgeous. Four Seasons (moderate) is a beautiful wooded trail. 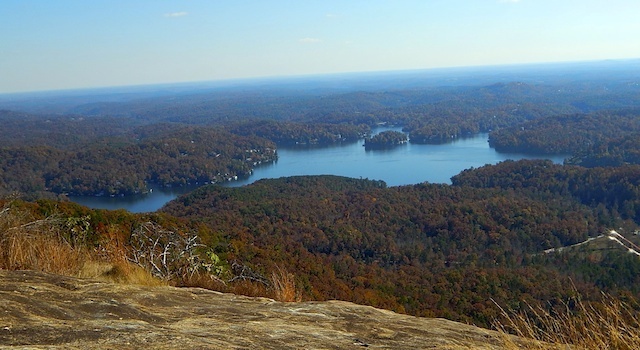 Exclamation Point Trail (strenuous) takes you to the top of a rock face with breathtaking views of Lake Lure and Hickory Nut Gorge. Directions: From Lake Lure Beach take 64E for 6.1 miles and turn left on Bill’s Creek Rd. Continue 1.9 miles and turn left on Buffalo Creek Rd. Continue on Buffalo Creek Rd. 4.9 miles passing Rumbling Bald Resort. The trailhead is on the left. Park on side of road at trailhead entrance. Highlights: This is a multi-us park for hiking, biking, trail running and even climbing. Beautiful wooded trails with many creek crossings. Some nice views along the way when foliage is down and pretty distant views of Lake Lure at the top. 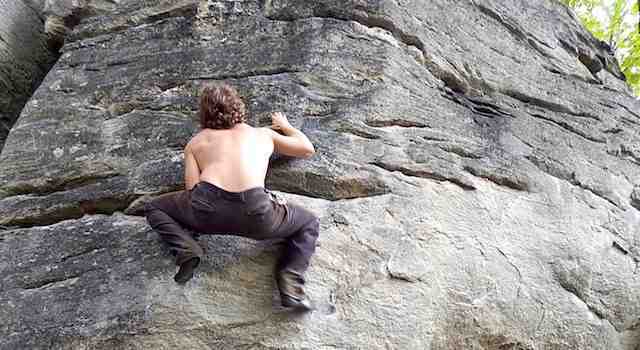 There is also a huge boulder field for climbers to enjoy. Directions: GPS users may enter N35.4734, W-82.3320 in their units. From the Lake Lure Beach and town center, head west on Memorial Hwy. (74A) for 7.7 miles (about 15 minutes). You will see the parking area on the right side of the road along with informative signs and the remnants of a chimney from an old house. 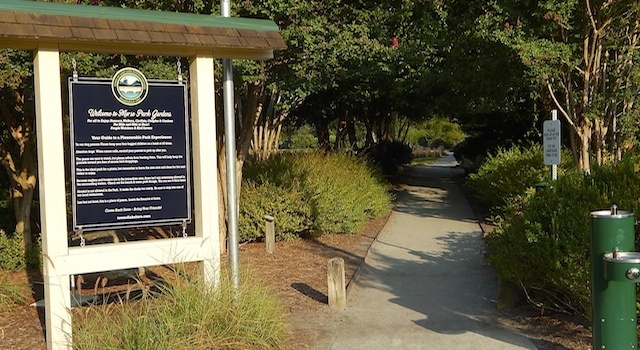 The Florence preserve trailhead is above the parking area and the Little Bearwallow Falls trailhead is across the street. Hiking Highlights: Hike the newly opened Phase 1 of the Little Bearwallow Trail to a 100-foot cliff and and see Little Bearwallow Falls. 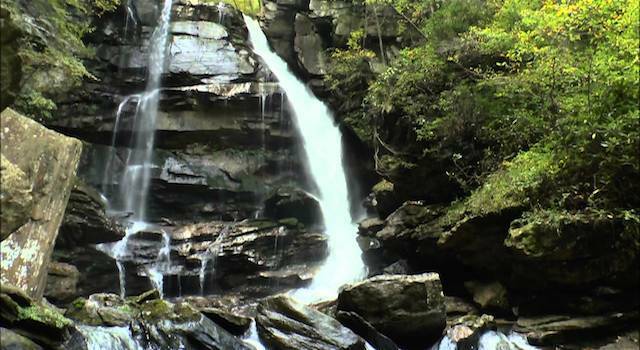 You’ll enjoy views of Hickory Nut Gorge, encounter several creek crossings and get the close-up view of Little Bearwallow Falls. This is a very enjoyable hike and the trails are very well done with regard how they are cleared and constructed with stone steps, bridges and trail markings. 11. 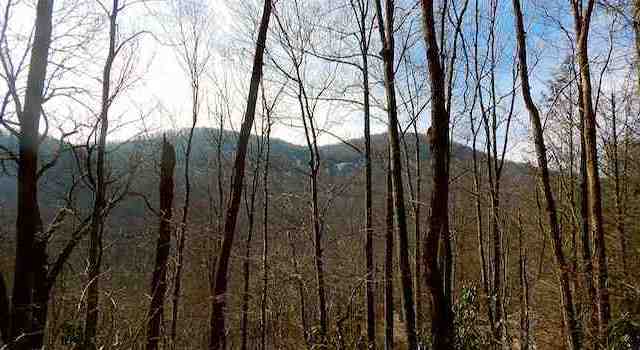 Trombatore Trail – Gerton, NC – FREE – Adjacent to Bearwallow Mountain Trailhead. Trailheads are on either side of the road. Hiking Distance: 5.2 miles round trip. 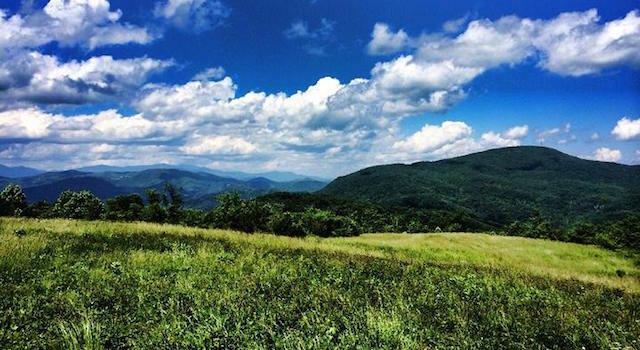 Highlights: This 5-mile round trip woodland hike takes you through the Upper Brush Creek watershed, along the Eastern Continental Divide to the grassy summit of Blue Ridge Pastures at 3,780 elevations. 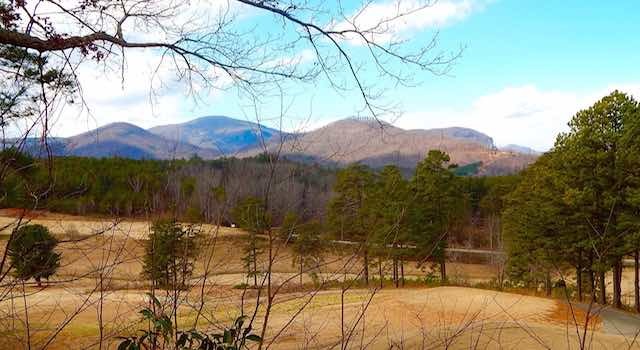 Enjoy breathtaking views of the Hickory Nut Gorge, including Bearwallow Mountain, Florence Nature Preserve, and Wildcat Rock. On a clear day, Mt. 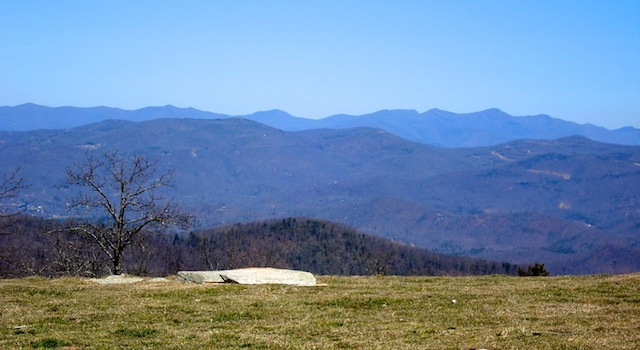 Mitchell and the Black Mountains are visible to the north. 12. Party Rock – Lake Lure, NC – FREE – Warning: Not an Official Trail – no designated parking and a small part of the trail may be on Private Property. Directions: From Lake Lure Beach take 64W .6 miles and turn right on Boys Camp Rd. Continue 2.1 miles and turn left on Carson Way. Continue .7 miles. Go up the narrow paved drive just past the entrance to Blue Heron Point Gated Community and park. Walk .2 miles up the dirt road to the trailhead on the left side of the road. Approximately 1 mile in you reach a side trail to the left that takes you to Party Rock – just past the truck in the trees – you’ll see. Highlights: Numerous great views along the hike when foliage is down. 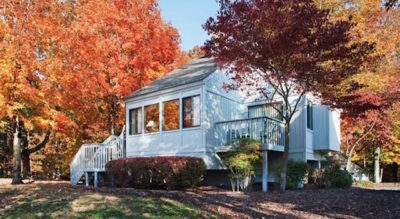 Once at Party Rock, spectacular views of Lake Lure and the surrounding terrain. The best views of Lake lure year round!!! 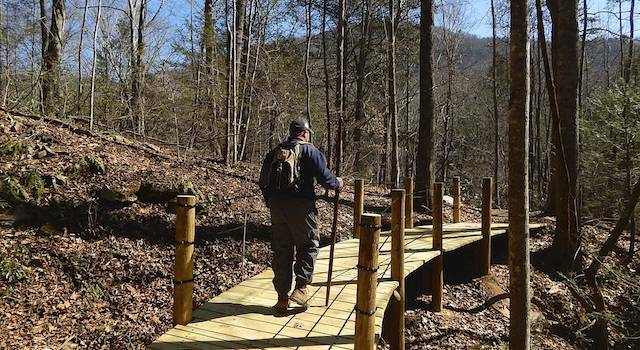 Nothing beats a great walk in the woods so let’s hit the trails and enjoy the natural splendor of Lake Lure, NC! Remember, be safe and don’t leave any evidence of your visit so others can enjoy their journeys.